but first, a birthday celebration (of sorts)! 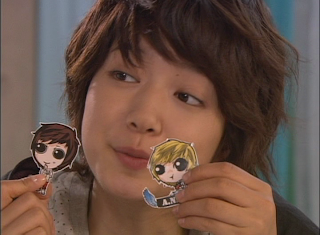 cute scene: she cannot do anything for her star. then she sees him run out of bottled water, and ran to get him a new bottle. followed by light bulb for the flickering light. at least Tae Kyung not that stupid. by then he figured out something wasnt quite right. so he decided to conduct a test. very hot coffee (to torture his unknown benefactor, typical Tae Kyung style) actually, he already knew who it could be. it was just a confirmation test. the funniest bit was. she's improving! she knows how to bribe! then she said happy birthday. she's way improving! she knows how to flatter! ROFL! a good korean birthday starts with seaweed soup! 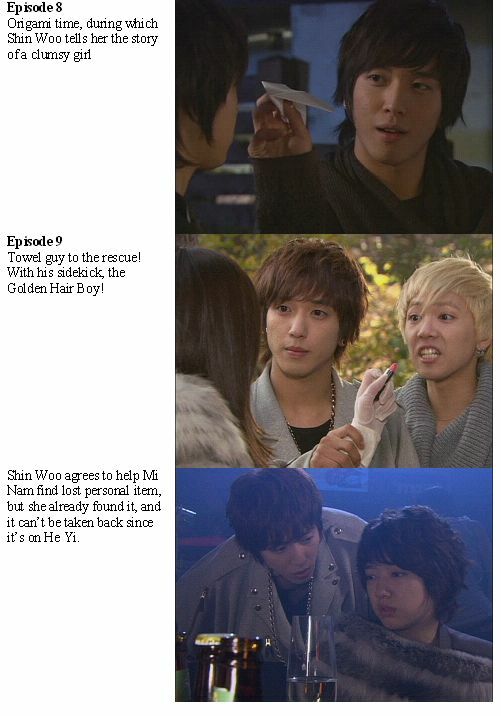 from the top, Shin Woo saw the hug and lost his cool! and he volunteer to help him search after the party. the evil He Yi puts on the hairpin to tease Mi Nam. since Mi Nam is a guy, he shouldnt want a hairpin and if he lost one, he can just buy another for his sis later on. so its not a cheap pin, its 100k won! so he took it back from He Yi to return to Mi Nam. this makes He Yi even madder, cos he spent so much on a cheap pin for Mi Nam! but when Tae Kyung ask Mi Nam about going to find her treasured item - ie hairpin, wanting to return it to her, she said she isnt going to look for it (she cant, its not missing, its stolen!) so he is now pissed about it too! cos he cant give it to her. in the van on the way back, Shin Woo shared with the guys that Mi Nam is actually now more sad when he didnt want to look for the item. Jeremy say that's cos he knew he couldnt find it so he said that. 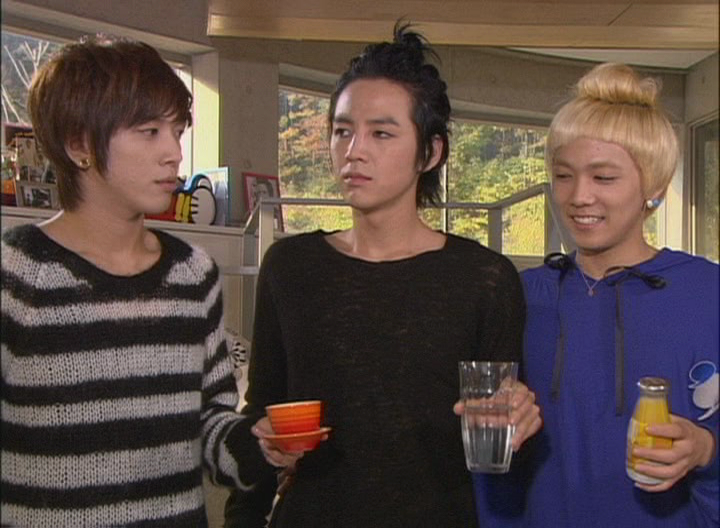 Tae Kyung now know what happened. 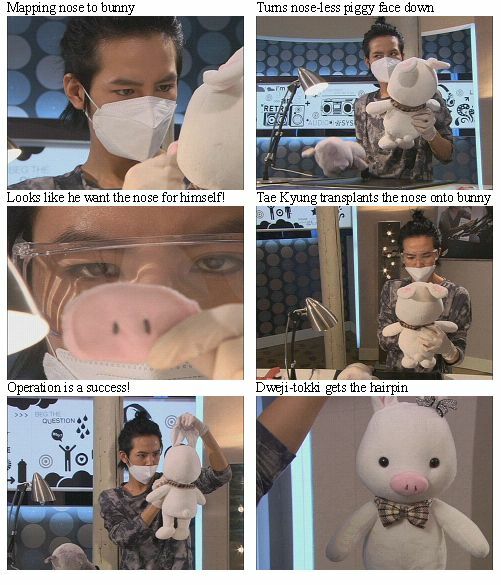 and the rest as we know it, is dwaeji-tokki history! 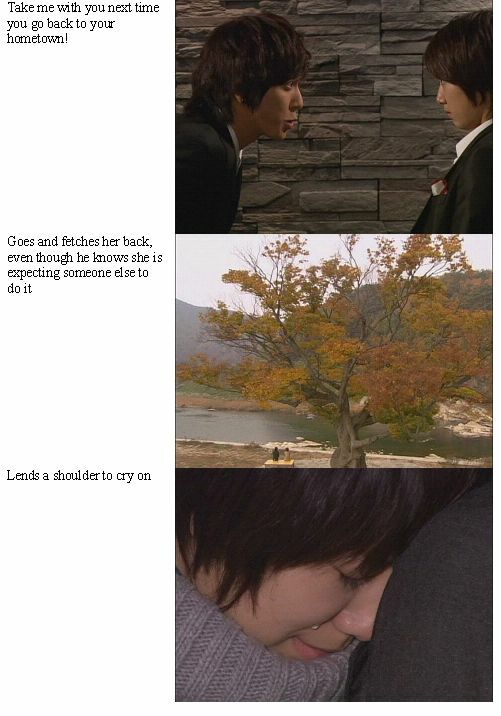 Tae Kyung cannot give it direct as Mi Nam didnt ask for it direct, so he has to give it to her indirectly. he complain to himself the headache that dwaeji-tokki is giving him. lol. which gave him the inspiration! Shin Woo won! Jeremy 2nd again. Tae Kyung IS LAST! Mi Nam's politically correct answer: like any other guy. likes black. Tae Kyung catches her on her own. and asks her. she say white. He Yi, who caught the conversation on the sly, is now super mad cos she got serious GIRL competition! now is He Yi turn to ask her which is her fave color/guy. pls turn to next episode for the answer!